More beautiful Spring weather over this past weekend motivated my husband and I to take the family outdoors to celebrate Father's Day. We went to a well known walk called the 1000 Steps Kokoda Memorial Walk in the Dandenong Ranges National Park on the outskirts of Melbourne. It is a memorial to the soldiers who fought and defended the Kokoda trail in Papua New Guinea in the second World War. So, it is narrow, steep and challenging. My children are 10 and 13, and I have to admit they were not willing participants in this activity that they were dragged into by their parents! My 13 year old son in particular was most challenged by the steepness of the steps. It gave me cause to reflect, as I waited for him and tried to encourage him. Indeed, I think the steps are designed to make you reflective. I reflected on the difficulty of the challenge and how it can be a metaphor for the challenge of life and for our health. 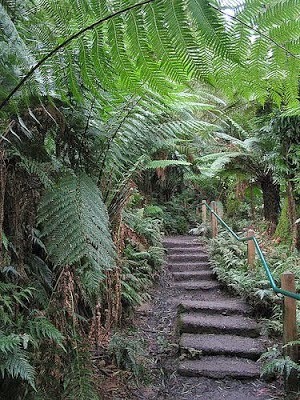 I likened each step we took on the path to the steps we take during our life. We find some steps really difficult to take, and others require less effort. Sometimes we need to rest before taking the next step, and other times we can keep going with less effort. Meanwhile we are surrounded by other people on their own journeys. Some finding it a greater struggle than us, and others seemingly taking effortless strides to pass us. (If you do this walk, you will see people of all different abilities on it). So wherever we are in our life, a large part of it is due to steps we have taken to reach there. Each day we are faced with decisions on which steps to take. Steps that will lead to greater health and vitality, or steps that take us further away from good health. It's a daily challenge for us, wherever we are on our health journey.